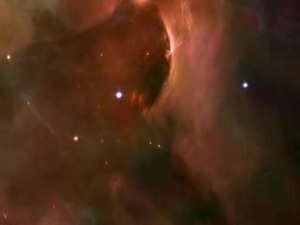 Discussing the location of the Orion Nebula, what is seen within the star-formation region, and the effects of interesteller wind in shaping the nebula. Amateur image of the Orion Nebula taken with a DSLR camera. The constellation of Orion with the Orion Nebula (lower middle). ↑ Press release, "Astronomers Spot The Great Orion Nebula's Successor ওয়েব্যাক মেশিনে আর্কাইভকৃত ১৮ ফেব্রুয়ারি ২০০৬ তারিখে", Harvard-Smithsonian Center for Astrophysics, 2006.